• Create and edit 360 content entirely within After Effects. Import stitched 360° footage to add text, logos, graphics and FX, do object removal and motion-tracking. • A workflow solution that address different aspects of 360/VR production. New! SkyBox Studio Version 2. Create and edit 360 content entirely within After Effects. Import stitched 360° footage to add text, logos, graphics and FX, do object removal and motion-tracking. 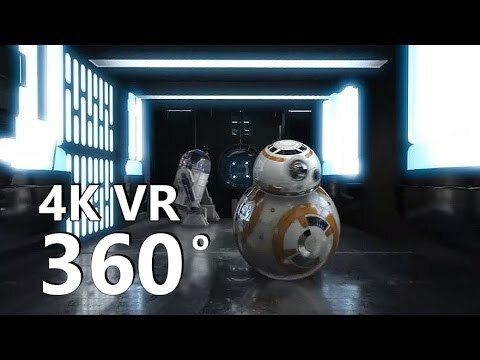 A workflow solution of 3 scripts and 4 plugins that address different aspects of 360/VR production. 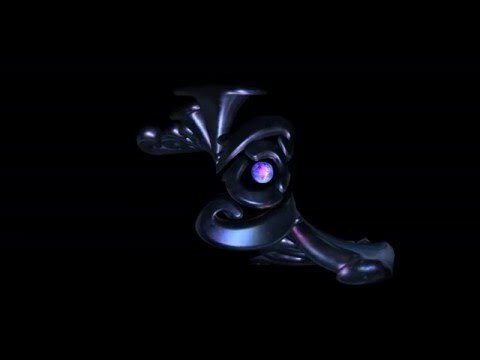 Works within After Effect's 3D space, with most After Effects 3D plugins, including Mettle ShapeShifter Ae, FreeForm, FreeForm Pro, Plexus, Trapcode Particular and Form, Video Copilot Element 3D and others. 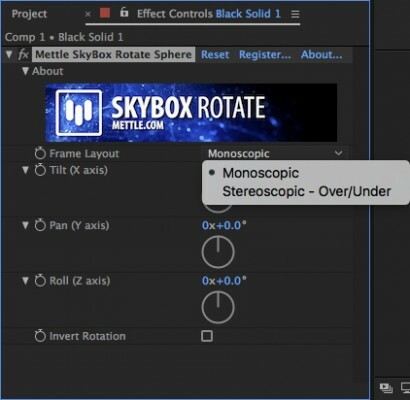 SkyBox Rotate Sphere Rotates 360 footage in Mono and Stereo formats. Fisheye (FullDome), Cube-Map Facebook 3:2, Cube-Map Pano 2VR 3:2, Cube-Map GearVR 6:1, Equirectangular 16:9. As well as Cube Map 4:3, Sphere Map, Equirectangular 2:1. 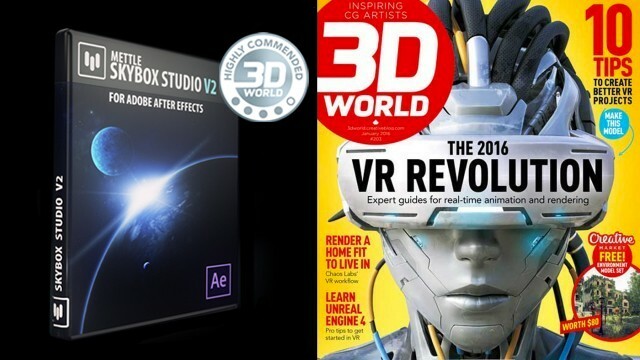 3D World is one of the most respected and prestigious industry magazines. SkyBox Studio was awarded "Highly Commended” badge". Click on here to download review in PDF format. SkyBox Studio has 7 modules that set up the 360/VR workflow in Ae. New module for SkyBox Studio Version 2. View-based editing for 360 production in After Effects. Creates a 360 Edit Comp that links to a 360 Output comp, automatically refreshes. 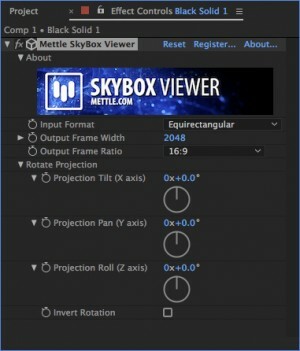 New module for SkyBox Studio Version 2. 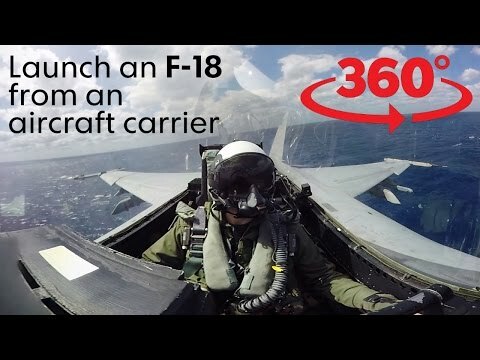 Quickly add 2D text, graphics, stills and footage onto Monoscopic and Stereoscopic 360 footage 1:1 and over/under 16:9. 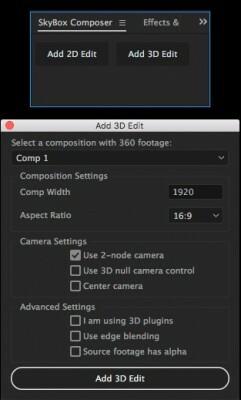 Automatically sets up all working comps and cameras necessary for 360 production in After Effects. Create a new 360 master composition, or brings an existing comp into a 360 format. 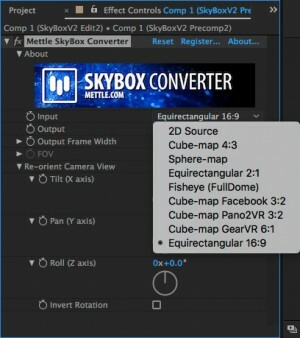 New formats for SkyBox Studio Version 2: Fisheye (FullDome), Cube-Map Facebook 3:2, Cube-Map Pano 2VR 3:2, Cube-Map GearVR 6:1, Equirectangular 16:9. Re-orient Camera Controls with Tilt (X-Axis), Pan (Y Axis) & Roll (Z Axis) controls. Input – 2D Source. Extracts an undistorted view from your stitched 360 footage. Makes it easy to do motion-tracking, object removal, add text, graphics and VFX to your comp. Preview your 360 format, one frame at a time. Jamie Pence of VideoBred (www.videobred.com) talks up his favourite features in SkyBox Studio V2, including the new SkyBox Composer Module which allows for View Based editing of 360 footage in Adobe After Effects. A real game changer. 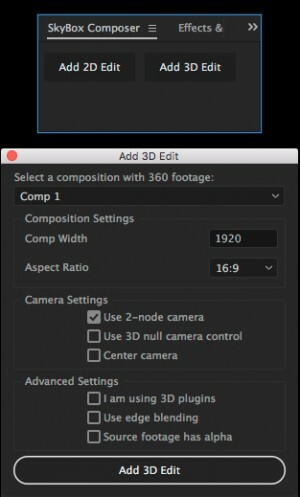 Charles Yeager This intro-level tutorial covers step-by-step: importing your stitched 360 degree footage, setting up your Main comp, placing a rectangular logo over your footage, and placing a round logo to cover the camera rig at the bottom of your composition. We also see how to use After Effects text tool for 360 video, and how to import flat (1920x1080) video, and integrate it over 360 footage. Charles Yeager shows how to stitch Samsung Gear 360° footage in After Effects using the SkyBox Studio 360/VR plugin. The Samsung Action Director stitching app in WIN only, so this method is the only way to stitch in Mac with better control and results. Try it out - download the FREE project file. 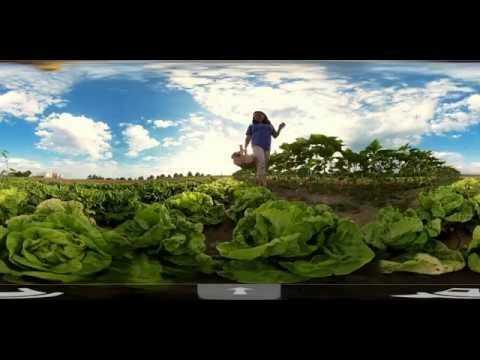 Samsung Gear VR 360° footage is shot with 2 Fisheye lenses at (3840 x 1920), 30 fps, and there is only one stitch line to deal with where the two lenses overlap. 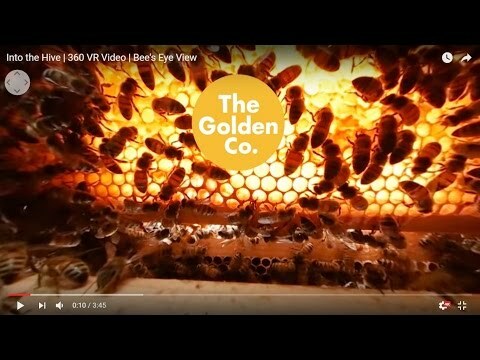 This technique works with any 360° footage that is shot with 2 lenses, such as the Ricoh Theta, Kodak Pixpro, Nikon KeyMission 360, and LG 360. The free project file is courtesy Mikey Borup (After Effects with Mikey). Josh KimmisCV Global was really impressed by the Michelle Obama 360, which was produced The Verge and Lunar North. 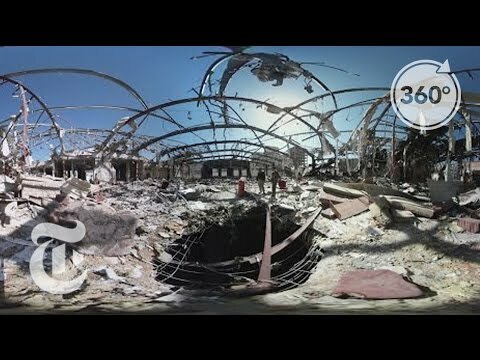 The 360 interview is a clever mix of 360 footage and 360 motion graphics that tells the story of how the First Lady mastered social media. 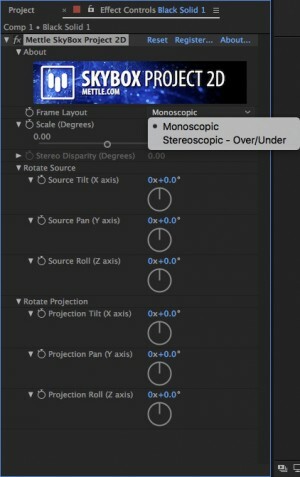 Josh has kindly made a tutorial that shows how to add the same style of motion graphics to 360 footage, using SkyBox Studio in Adobe After Effects, the same production pipeline used by The Verge and Lunar North. 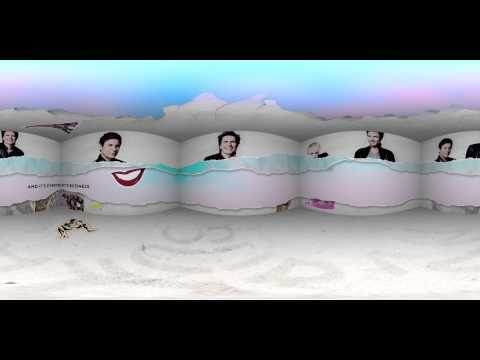 It shows how anyone with 2D motion graphics experience can easily make the jump into 360 production. Download a free demo and follow along. Charles Yeager sets up a basic 3D scene in After Effects, using an Element 3D cityscape. He explores the features of SkyBox Studio, so you can learn about how the plugin works. 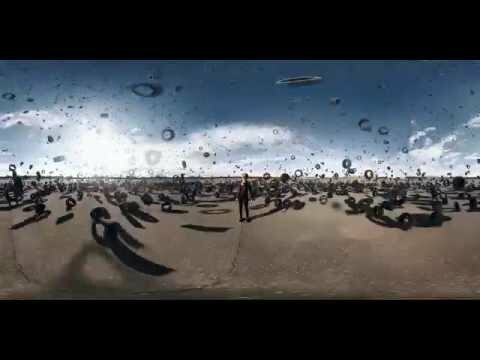 He animates a camera in the 3D scene, and shows how to inject youtube metadata into the rendered video, so it can be uploaded and viewed in 360°. 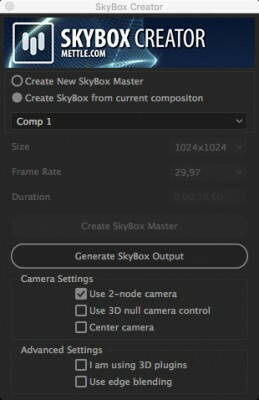 Chris Bobotis shows how to remove a fixed camera rig from 360 footage, using SkyBox Studio in After Effects. 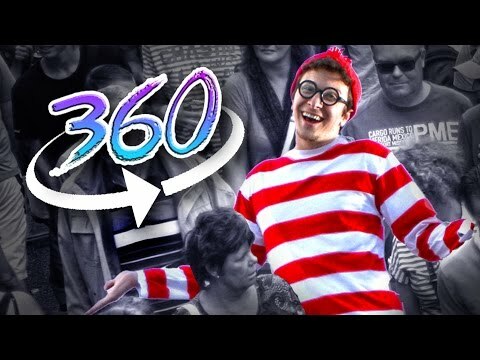 Mikey Borup shows how to add effects to 360 footage. Includes how to add a watermark, object removal, compositing, color correction, lens flare and glow, add an Element 3D sphere. 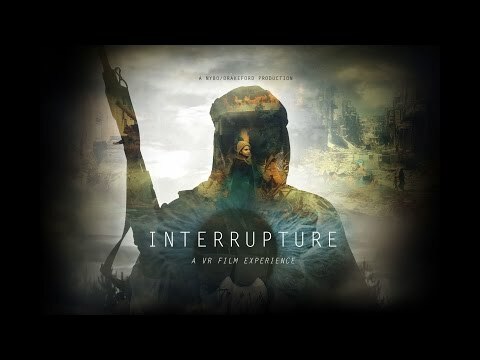 Mikey Borup shows us exactly how to 3D Camera Track 360 footage in After Effects. He camera tracks a Billboard, and adds a 3D Rock into the scene. 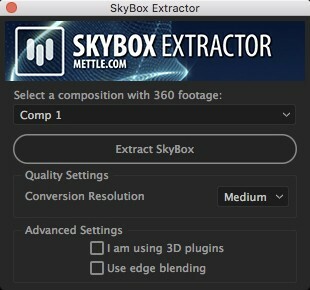 Alex Vasutin uses the SkyBox Converter "Re-Orient Camera View" feature with Camera Tracking data to stabilize his 360 footage. He then composites an explosion, smoke, and a flash of light with radioactive particles. He also adds a camera shake to his blast. Chris Bobotis shows how to add 2D text to 360 footage in After Effects using SkyBox Studio. 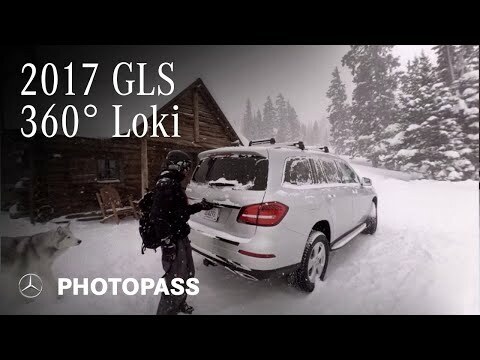 This is an easy way to add a watermark or simple text onto your 360 footage. Chris Bobotis shows how to add 3D text to 360 footage in After Effects using SkyBox Studio. 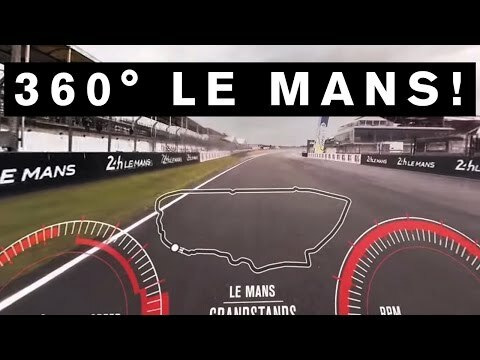 This makes your text look integrated into the 360 scene. Mikey Borup shows us how to generate a YouTube 360 format sequence in After Effects. He uses Mettle SkyBox with Element 3D. Charles Yeager shows us optimal compression settings in Adobe Media Encoder for 360 Video. He also walks us through the youtube metadata tools, which are a necessary step for your video to play properly in youtube 360. 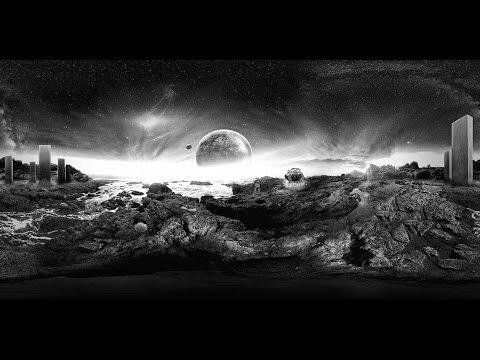 David Oldani explains how to use SkyBox with Trapcode Particular and Element 3D. David Oldani explains how to use an existing 3D After Effects comp to create an environment map for use in Element 3D. * Fixed propagation of lights from edit comp to skybox output. 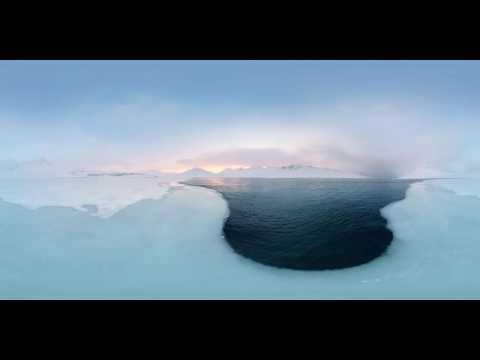 - SkyBox Rotate Sphere Rotates 360 footage in Mono and Stereo formats. - Fisheye (FullDome), Cube-Map Facebook 3:2, Cube-Map Pano 2VR 3:2, Cube-Map GearVR 6:1, Equirectangular 16:9. As well as Cube Map 4:3, Sphere Map, Equirectangular 2:1.